The GTA: Episodes of Liberty City trailer which will include footage of The Ballad of Gay Tony, will be live online at 1 P.M. EST tomorrow. That's 6 P.M. GMT for those in the UK, and 3 A.M. if you're in Eastern Australia. Thanks for the heads up Adriaan. 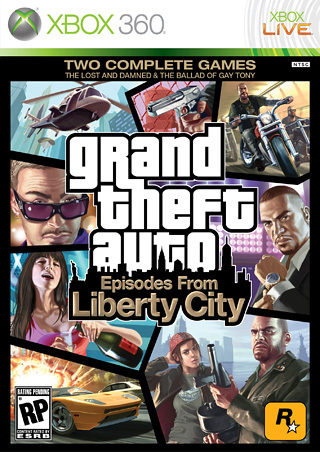 Rockstar have just revealed what the Episodes from Liberty City box art cover will look like, it features new artwork from both downloadable episodes. Take a look below. Don't forget The Ballad of Gay Tony will have it's debut trailer released tomorrow, so keep an eye out for that around this time tomorrow. Rockstar Games have just announced that Chinatown Wars will be appearing on Apple's iPhone and iPod touch later this year. There's no details on the game, other than the fact it is being developed by Rockstar Leeds, and that it is expected to be released around the same time as the PSP version. "Chinatown Wars is a perfect match for the iPhone and iPod touch, we are very excited to bring this incredibly ambitious version of Liberty City, with this level of detail and immersive gameplay on Apple's new gaming platforms." Four fansite exclusive Gay Tony screenshots! Rockstar have just sent out four awesome exclusive screenshots to the GTA fansites each showing an action packed scene from The Ballad of Gay Tony. Check them out below. Thanks guys! Remember the debut trailer is launching on Tuesday, 1st September. Stay tuned! Ballad of Gay Tony trailer on Tuesday, Skydiving!? Good news everyone! The first trailer for The Ballad of Gay Tony will be launching on Tuesday, 1st September, according to a blog post by Rockstar. Some accompanying stills appear to show Luis skydiving (possibly)! Take a look for yourself, and let us know what you think of this. First Chinatown Wars PSP screenshots! Rockstar Games have just updated the official Chinatown Wars website with the first seven screenshots from the PSP version of Chinatown Wars. Click the thumbnails below for the larger versions. You can tell straight away the obvious improved visuals, as well as the widescreen. Looks a lot nicer than the DS version you have to say. Keep an eye out for more updates today. Rockstar Games have redesigned and relaunched their official website, thankfully moving away from a full flash layout and going with something much more friendly and modern, and I must say it's a huge improvement, so check it out over at RockstarGames.com. In addition, two new wallpapers have been added for The Ballad of Gay Tony. Check them out below. Once you have created a Friends List you can begin using the Message Wall. The Message Wall is a unique verbal and visual means of mouthing off to your Friends � including a direct message system and customizable personal graffiti wall. Communicate, talk trash with your Friends, and decorate and/or desecrate each other�s Walls at will. Look for more additions to the Friends System and Message Wall in the future. Rockstar Games have announced via their Twitter that the PSP version of Chinatown Wars will be released both on UMD and digital download from the PlayStation Store. It was also said that the "first screens and more" are coming soon. Keep an eye out for more updates. UPDATE: Rockstar have also now confirmed the above is the North American release date, Europe and the rest of the world will get it on 23rd October, as expected. After a long time in development, the MTA Team have finally released the final build of Multi Theft Auto San Andreas - a popular mod allowing you to take San Andreas online and play with/against people from all over the world. Version 1.0 combines both the race and deathmatch modes into one unified client. Hundreds of bug fixes have been made, and a number of new features have also been added. Some reasons why you should upgrade are provided on their wiki. 4:30 A.M. Well, the upgrade went very smoothly. We took a little longer than expected getting it all configured how we wanted it and implementing a few other changes. For the most part it's pretty much done now. Please head over to the upgrade topic which gives details of the upgrade itself and various changes we've made to various aspects of the forum. You should definitely read that. If you're not already a member of our ever-growing forum, now would be a great time to join our community! Being a member has many benefits, being able to post topics and chat with other users being an obvious advantage, and you'll also be able to upload mods to our downloads database, among other things. If this sounds like something you might be interested, go ahead and sign up, it only takes a few moments! I mentioned on our Twitter feed earlier this week that today we would most likely be looking to upgrade our forums. This is now going to happen at 1:30 A.M (UK time) when our traffic levels have dropped. Obviously our forums will be offline for the duration of the upgrade, and some parts of the website will be non-functional until it is completed, such as the user area of the downloads database. Our upgraded forums will have many new useful features that IPB3 introduces, and will bring us greater capabilities for expanding in the future. There will be a pinned topic detailing new features and explaining some other changes we will be making, and this news post will be updated with all relevant links once the process is complete. The forums will remain online for the next few hours until we're ready to upgrade. Any questions/concerns can be posted in the comments. 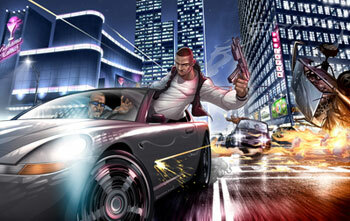 Patrick Brown is back with some more amazing fan art, this time for The Ballad of Gay Tony. Check it out below. Week five of our round-up, I've selected what I think are the best mods the community has produced this week. In addition the new cars above, a few we have previously posted about have been updated with various improvements or bug fixes, so if you're using one of them you may want to re-download and update it to take advantage of the new version. The Lost and Damned will be Xbox LIVE's deal of the week from 24th August, so if you haven't already got it now would be an excellent time to do so. The price is being reduced to 1200 Microsoft Points ( USD) from the usual 1600 Microsoft Points ( USD). UK publication Xbox World 360 will be giving us the world's first hands-on preview of The Ballad of Gay Tony. According to the promo image the magazine will be on sale from Monday, 7th September. Rockstar have already given us a fairly vague "very soon" message for the first trailer, and we'd like to think we'll see this before September, and perhaps some screenshots too. Keep an eye out for more news soon. Ballad of Gay Tony trailer coming "very soon"
Rockstar Games revealed on Twitter in the early hours of this morning that a trailer for The Ballad of Gay Tony is coming "very soon". How soon is "very soon" you might ask, well big site updates and trailers are usually launched by Rockstar at the end of the week, so maybe even tonight. Next week is perhaps more likely, but we'll keep you posted on any specifics we learn of. If you're a Twitter user yourself remember you can follow both Rockstar and The GTA Place to keep up to date with all the latest news. Nothing here take your fancy? Remember you can always sort the vehicles by most recently updated if you want to see the complete list containing many more great cars. I've had a couple of requests of offers to help with this, however, aside from uploading mods (make sure you have the author's permission if it isn't yours) there isn't much you can do. We are looking to update our modding tutorials and FAQs though, as at the moment we only have a severely outdated FAQ which doesn't even include GTA IV modding. I'll hopefully get something done myself for this, but we'd also like to provide translations of any tutorials we add. So if you can help with anything of that sort then let me know. TLaD PC trailers possibly being shown at gamescom? According to German classifications board Unterhaltungssoftware Selbstkontrolle (that's USK to us normal folk), two trailers for The Lost and Damned have recently been rated by them for the PC, both marked as "gamescom-Trailer". Here's a link to this information. Gamescom is a new trade fair for the gaming industry, with over 300 exhibitors due to show off their products in Cologne, Germany on 19-23rd August. Rockstar Games are indeed due to exhibit there, so the information appears to check out. No official announcement has come from Rockstar or Microsoft yet though, and of course we can't really trust ratings boards these days, whilst they have been known to accidentally leak information, they've also been known to make mistakes in the past. Another possibility is that the USK could have easily made the mistake of actually meaning The Ballad of Gay Tony trailers. The fact it says "PC" under the system heading is simply due to the fact the trailers will be shown on a PC. Though one might question the decision to show two trailers at once, and why at gamescom? With all due respect, it's not the biggest audience to show a new product to. 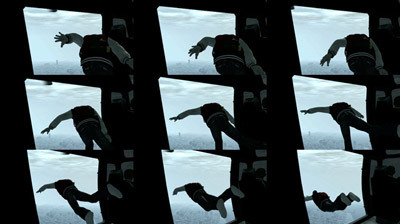 If you search for the original GTA IV trailers for the consoles, you'll notice they're marked as being for "PC", when quite obviously it is meant that they were being released/shown on the medium of PC which if you remember is exactly what happened, it was only later in the day/week that the trailers were put on the Xbox Marketplace and PlayStation Store. So anyway, take the news with a pinch of salt for now. Basically, we, and in fact nobody has any idea what this is all about. We'll update you if we hear more on this matter. If not then we'll have to wait until gamescom begins to find out what exactly is being shown there. UPDATE: Rockstar have confirmed that all trailers are released under the PC platform as they are submitted for playback on PC. Which confirms my thoughts on that, and also confirms that it doesn't mean that TLaD will be coming to the PC (though it doesn't rule it out either).